Ureteroscopy (URS) is a commonly performed and a safe urological intervention. However, potentially serious infective complications are possible after URS. A young nondiabetic woman developed severe Gram-negative septicemia after ureteroscopy for a lower ureteric calculus. The sepsis progressed to symmetrical peripheral gangrene of all the four limbs. She required left below-elbow amputation, right below-knee amputation, and loss of all toes and digits of the other two limbs. 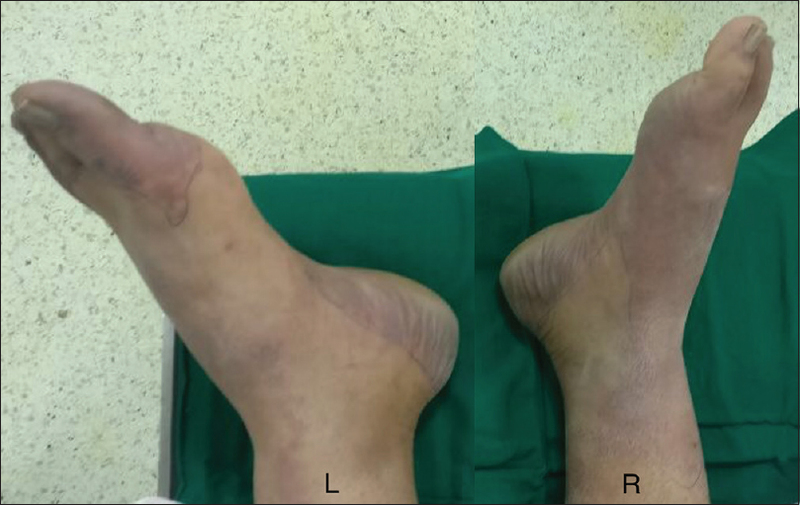 Symmetrical peripheral gangrene (SPG) is defined as distal ischemic damage in two or more extremities, without large vessel obstruction or vasculitis. It is associated with various underlying medical conditions and is a rare but significant complication of septicemia, with up to 40% mortality. Factors such as immunocompromised state, diabetes mellitus, renal failure, increased sympathetic tone, and the use of vasopressors would aggravate SPG. We report a case of all four limbs' SPG secondary to combined septicemia and vasopressor use following ureteroscopy (URS) for a lower ureteric calculus in a young woman. To the best of our knowledge, this is the first reported case of symmetrical peripheral gangrene following URS. A 38-year-old nondiabetic woman presented with a 5-day history of flank pain with fever. Her preoperative investigation showed raised total leukocyte counts (23,000), normal creatinine, significant pyuria, and urine culture grew Escherichia More Details coli (>105 colony count). A noncontrast computerized tomography of kidney, ureter, and bladder confirmed a 10-mm obstructive calculus in the left lower ureter. URS was performed under spinal anesthesia with a cover of appropriate antibiotics. Intraoperatively, once the ureteric catheter was placed by the side of the calculus, thick pus drained from the left pelvicalyceal system. The treating urologist continued with the ureteroscopy, fragmented the calculus with Lithoclast, and placed a double-J stent. Postoperatively, within 6 hours, she developed high-grade fever (103° F), hypotension (systolic blood pressure [BP] of 60mm Hg), and acute respiratory distress syndrome (ARDS). She was started on vasopressors and ventilator support and was transferred to our center for intensive care and management of Gram-negative septicemia. Once in the intensive care unit, blood parameters were repeated, and urine and blood culture samples were taken. Antibiotics were stepped up to a combination of piperacillin–tazobactam and aminoglycoside at maximal recommended doses. Fluid resuscitation was done to maintain a central venous pressure of 10 cm water. She needed a high dose of dopamine and norepinephrine to maintain her BP. Ventilator support was provided in the prone position. She showed a gradual improvement over the next 60 hours, but needed vasopressor and ventilator support for more than 5 days. On presentation, acrocyanosis of all four limbs was documented. Her coagulation panel including partial thromboplastin time, D-dimer, and fibrinogen levels were within normal limits. Cardiac evaluation was done to rule out any cardiac source for thrombotic episodes. Despite acrocyanosis, vasopressors could not be tapered for 3 days and were needed for 5 days. The acrocyanosis gradually progressed to all four-limb peripheral gangrene over the next 3 days [Figure 1] and [Figure 2]. Multispecialty management was started; apart from intensivist, plastic surgeon, infection disease specialist, and anesthetists were involved. She was managed with appropriate antibiotic therapy, conservative local debridement, and secondary skin grafting. Sympathetic blockade by bilateral supraclavicular block and bilateral popliteal nerve block was attempted without much success. Although she survived her septicemia, she has undergone left below-elbow and right below-knee amputation. There is a loss of all fingers and toes of the other two remaining limbs. She stayed in the hospital for 25 days. Ureteroscopy is a well-established treatment for ureteral and renal stone disease. Infection and sepsis are recognized complications of URS occurring in about 7.4% of patients. Post-URS sepsis results in significant morbidity and mortality and has been correlated to many variables such as the presence of diabetes mellitus, the presence of ischemic heart disease, same-session bilateral URS, and high-volume stone disease. A significant association has been documented with preoperative positive urine culture and infection. This patient had presented with fever of 5-day duration and was in obvious clinical sepsis. While SPG is well documented in the literature, all four limb' SPG has not been previously reported as a postoperative complication following URS. This phenomenon is precipitated by characteristic triggers of SPG, including septicemia, hypotension, ARDS, and the use of vasopressors. It is important to be aware of SPG in the septic postoperative patients. SPG should be suspected at the first sign of marked coldness, pallor, cyanosis, or pain in the extremity, together with an increase in serum lactate levels. This condition can progress rapidly to frank gangrene without timely intervention. In our patient, although acrocyanosis was documented on admission to ICU, she had features of septicemia, hypotension, and ARDS and needed high-dose vasopressors for 3 days. Disseminated intravascular coagulation (DIC) is seen in up to 85% of cases of SPG. Molos et al. asserted that SPG should be considered a cutaneous marker of impending DIC, and early recognition and treatment of the underlying medical problem and DIC could be lifesaving. Interestingly, our patient never developed any signs of DIC. No treatment has been found to be completely effective. Early recognition of acrocyanosis, quick reversal of DIC, and effective management of the underlying condition and hemodynamic stabilization may be helpful in arresting the progression of pregangrenous changes to frank gangrene. Despite aggressive fluid resuscitation, our patient needed vasopressor therapy for 5 days. In this period, frank gangrene had set in with a clear line of demarcation [Figure 1]. She required left below-elbow amputation, right below-knee amputation, and loss of all toes and digits of the other two limbs. It is unclear if this unfortunate event have been avoided if the primary treatment was either a percutaneous nephrostomy or a DJ stent. This patient may still have developed severe sepsis, but literature suggests that the incidence of sepsis is higher if URS is done in the presence of active infection. The high intrarenal pressures generated during the ureteroscopy can flare-up a preexisting infection. Second-stage ureteroscopy is a safe mode of stone treatment in those initially presenting with obstruction and sepsis although there may be increased hospital stay, prolonged requirement of antibiotic use, and prolonged stent duration. Gram-negative sepsis is a dreaded complication of ureteroscopy. Awareness, early recognition, and prompt management of SPG are essential to reduce its morbidity. We thank Dr. Anita Mathews, Infection Disease Specialist, Dr. Rahul Pandit, Intensivist, Dr. Sitaram Prasad, Plastic Surgeon, and Dr. Lokesh Chinchkhede, Anaesthetist, for their help in the management of this rare complication. Sharma BD, Kabra SR, Gupta B. Symmetrical peripheral gangrene. Trop Doct 2004;34:2-4. Parmar MS. 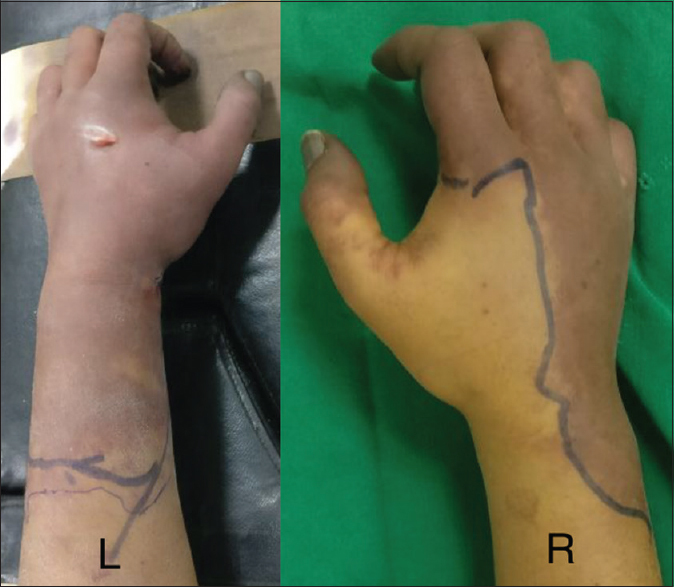 Symmetrical peripheral gangrene: A rare but dreadful complication of sepsis. CMAJ 2002;167:1037-8. Blackmur JP, Maitra NU, Marri RR, Housami F, Malki M, McIlhenny C, et al. Analysis of factors' association with risk of postoperative urosepsis in patients undergoing ureteroscopy for treatment of stone disease. J Endourol 2016;30:963-9. Molos MA, Hall JC. Symmetrical peripheral gangrene and disseminated intravascular coagulation. Arch Dermatol 1985;121:1057-61. Mitsuzuka K, Nakano O, Takahashi N, Satoh M. Identification of factors associated with postoperative febrile urinary tract infection after ureteroscopy for urinary stones. Urolithiasis 2016;44:257-62. Youssef RF, Neisius A, Goldsmith ZG, Ghaffar M, Tsivian M, Shin RH, et al. Clinical outcomes after ureteroscopic lithotripsy in patients who initially presented with urosepsis: Matched pair comparison with elective ureteroscopy. J Endourol 2014;28:1439-43.